i.e. the same as you would use for Blackboard, MyHub, etc. You will then be able to access the Proquest Ebook Central title you wish to read. Read Online is the best option. After 5 minutes of browsing you may be asked to create a loan. Choose yes if prompted to do so. If you need to continue accessing an ebook after the loan has expired, you can simply create another loan, there is no limit to the number of times you can access a Proquest Central ebook. Note these loans are not counted as part of your Library borrowing and will not be listed in MyLibrary. You have 5 minutes browsing online before you are asked to borrow. Click the Details tab to see the loan period. Once you borrow the ebook you can log in from anywhere to read it online. When you log in again after you have borrowed it, the duration of your loan period will be displayed at the top of the screen. The video below provides a quick overview and information on how to search for books in Ebook Central. This option is only available for those ebooks the Library has purchased, and you will need to have Adobe Digital Editions or Bluefire Reader (Bluefire reader is used on MACs) installed on your computer. You can download in PDF or ePUB format. Adobe Digital Editions (ADE) is software designed for reading and managing eBooks in EPUB or PDF format that are protected by DRM. 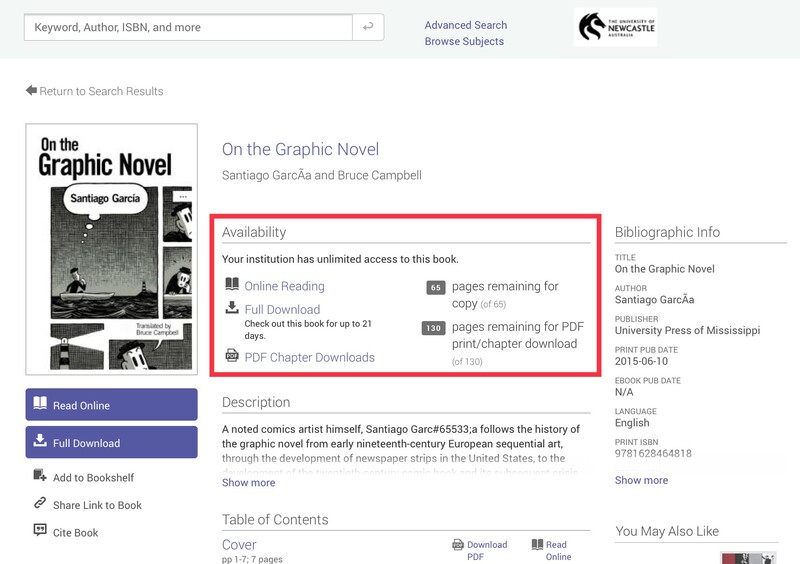 It is needed to download ebooks from many of our ebook collections. It is not compatible with Apple devices - see Bluefire Reader below. Create an Adobe ID when prompted. An Adobe ID allows you to use protected books on multiple computers and mobile devices. You can authorise up 6 computers and devices. Authorise each of your compatible machines with your Adobe ID to access all your available books and documents. See Digital Editions Supported Devices to check compatibility. Bluefire reader is available for iPad, iPod Touch, iPhone and Android devices. When you next download a book on that device, Bluefire Reader will ask you to enter your Adobe ID. If you do not have one, you can create an Adobe ID here. Proquest Ebook Central presents the book pages as PDF images, rather than text. Simply select words on a page, and a contextual menu will pop up with five icons (copy, 3 highlighter colors, take notes); select the Copy icon on the left. You also can choose the Copy function from the upper toolbar. This copies the entire page, by default. In both cases citations will automatically be appended to the copied text. 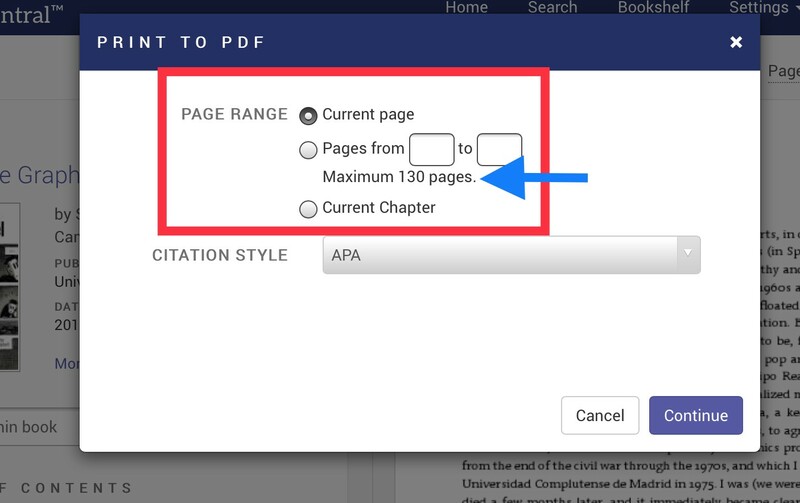 Alternatively, type in the number of pages you want to print, or select the chapter. Choosing Print gives you the option to download a locked PDF of the pages selected. On the Print page you can see how many pages you are allowed to print from that ebook. The Copyright Act states 10% of the book or one chapter. You can then select to print the Current page, a range of pages, or a whole chapter. To access ebooks you need to be logged in with your standard UON log-in.